November, the month of the Holy Souls, always brings with it a number of articles concerning the current state, or plight, of Catholic funerals and Masses for the Dead. As the years pass, we are fortunate to see a double outcome of Summorum Pontificum: first, an always growing presence of the traditional Requiem Mass with its full panoply of symbols and chants (including the great Dies Irae), as can be seen in the photo albums published here; and second, an ever more widespread acknowledgment that something has gone drastically wrong with the way Catholics approach prayer for the dead. I would like to mention here four recent articles of potential interest to NLM readers, and give a few excerpts. The first is “The scandal of the modern Catholic funeral,” one of my daily columns at LifeSite. Once upon a time, a very important person in my life died. I attended the funeral. It was a Novus Ordo canonization ceremony, conducted by a priest and three women in skirt-suits ministering in the sanctuary. Everyone at the funeral was dressed in black—except for the priest, who was wearing white. The disjunct was glaring and tasteless. The contrast between the deep human instinct of mourning, which can be said to be an ineradicable part of the sensus fidelium, and the crackpot liturgical reformers who introduced white as a color for Masses for the dead, was never so obvious to me. The day before, however, my family and I had gone to a traditional Requiem Mass, sung by a priest friend. The contrast was not just profound, but shocking. Between that day and the following, we were emotionally suspended between two radically different offerings for the dead: one that took death with deadly seriousness, that cared about the fate of the departed soul, and allowed us to suffer; another that shuffled death to the side with platitudes and empty promises. 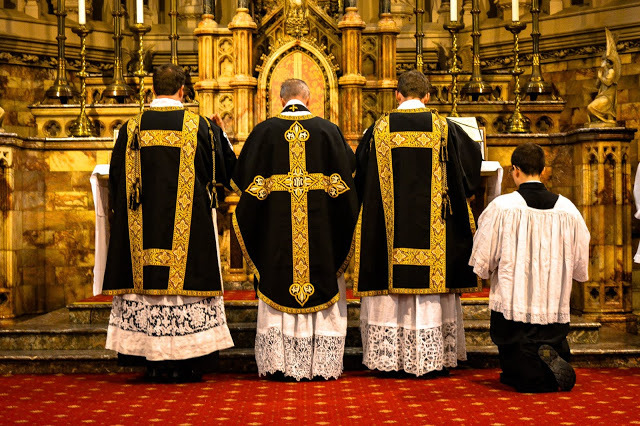 The contrast between Friday’s black vestments, Dies irae, and whispered suffrages and Saturday’s stole-surmounted white chasuble and amplified sentiments of universal goodwill seemed to epitomize the chasm that separates the faith of the saints from the prematurely ageing modernism of yesterday. I found myself thinking: The greatest miracle of our times is that the Catholic Faith has survived the liturgical reform. "They got rid of texts that smacked of a negative spirituality inherited from the Middle Ages. Thus they removed such familiar and even beloved texts as the Libera me, Domine, the Dies irae, and others that overemphasized judgment, fear, and despair. These they replaced with texts urging Christian hope and giving more effective expression to faith in the resurrection." The idea that the texts at issue “overemphasize” “despair” (how much should despair be emphasized, one wonders?) is a gross mischaracterization. The texts of the ancient Mass for the Dead speak of God’s mercy and the gift of salvation, in the context of human guilt and God’s justice. It is an unsurprising sociological fact that people are more willing to sacrifice themselves for their community if they see that such sacrifices in the past have been honored by the community. If we are not prepared to honor them when they fall, we should not expect our young people to put themselves in harm’s way for our protection. May each passing November, and indeed the passage of each one of Christ’s faithful into eternity, be accompanied by obsequies and orisons worthy of the dignity of Christian baptism, testifying to the reality of the Four Last Things and redolent of the piety, devotion, and earnest prayer of the ages.